This end of beginning of year has me watching Samin Nosrat’s Netflix series “Salt, Fat, Acid, Heat” based on her book by the same name exploring and explaining the essentials of great cooking. Anyway, some Brussels sprouts sunshine popped out New Year’s Day and paired delightfully with the crunchy, salty, oily Italian bread. The recipe follows... as well as a beautiful, energetic rendition of the Gayatri mantra. 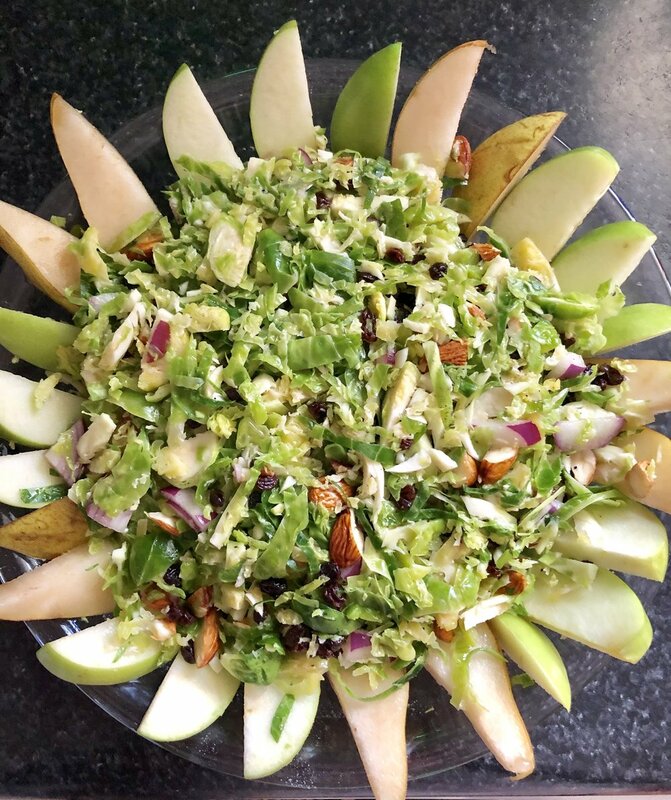 Shredded brussels sprouts, finely sliced red onion, sliced toasted almonds, currants (you could also add kiwi and green apple as I did in my second batch). The plate in the picture is lined with peers and green apple. Olive oil, champagne vinegar, the juice of one lemon and the juice of one tangerine or orange, Dijon mustard, garlic, a touch of honey, and salt and pepper to taste. “Be your own best friend. Look in the mirror at yourself each day. Closely. Recognize your magnificence and beauty - your radiance. Be inspired to seek inspiration. Love all of yourself, even the not so pretty parts. And live learning. Make decisions guided by what feels right for you - as a body - right now. Be honest about how a relationship adds to or detracts from you loving yourself. Believe in the possibility of new possibilities. Have confidence that you are just right, just the way you are. Make trust and respect a requirement for all relationships. Do not invest deeply in people who cannot love you as you are today. Don’t let “love” weigh you down. Whether in health, relationships or career, having what you truly desire REQUIRES YOUR ON-GOING COMMITMENT TO YOURSELF. I am a beautiful miracle of creation, connected to all living things. May my work contribute to health and harmony within me and all I come in contact with. Today.